We're big fans of The Book People here at PlayPennies, as they're pretty much unbeatable on price, and when they have a special offer the savings are crazy. Right now they have 70% off book collections, meaning you can pick up collections from as little as £3.99! You can also get FREE delivery when you spend £10 with the code POST10, or new customers can get free delivery on their first order with the code NEW19. The Peppa Pig 10 Book & 10 CD Collection* is a great bargain gift for a Peppa fan, and it's just £15.99 with free delivery (RRP £69.90). 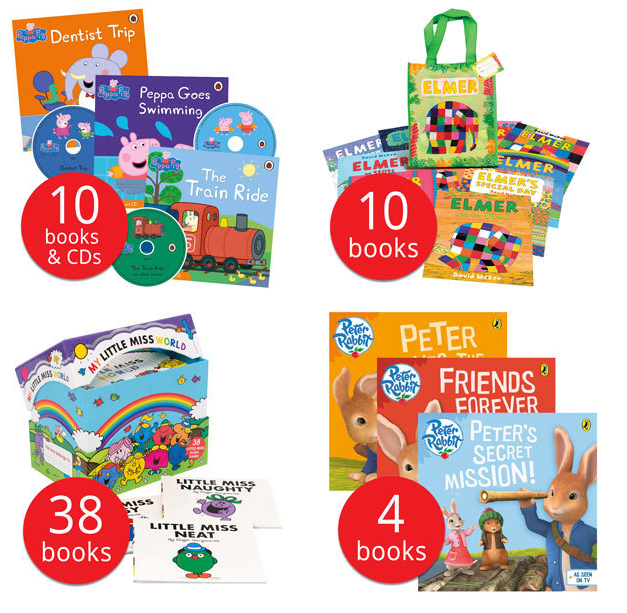 We also love this new Elmer 10 Books In A Bag Collection* down to just £12.99 delivered (RRP £69.90) and in that bright fun bag it will make a fab present. Also worth snapping up is the My Little Miss World Collection* as it includes a whopping 38 books for £24.99, meaning you're paying just 66p per book when they have an RRP of £3.99 per book! These are perfect for stocking up on a favourite author, popping by for gifts, or splitting up the collections to make party gifts or school holiday boredom busters for the kids. You can find The Book People voucher codes in our voucher section, along with many more money saving promotional codes for other stores.